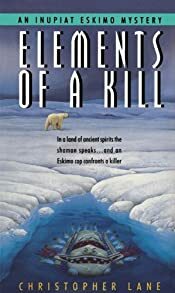 MystereBooks is pleased to feature Elements of a Kill by Christopher Lane, now available at a special price, courtesy of the publisher, Avon. The ebook format of this title was priced at $0.99 from the listed vendors (below) as of the date and time of this post (06/30/2013 at 12:30 PM ET). Prices are subject to change without notice. The price displayed on the vendor website at the time of purchase will be the price paid for the book. Please confirm the price of the book before completing your transaction. A mysterious ritual murder at a remote Alaskan oil rig brings an Inupiat Eskimo police detective back to the land of his People to catch a killer, and save his own hide. Police Detective Ray Attla, an Inupiat Eskimo, is spending a few days with his grandfather on the reservation when he's called into the icy Alaskan wilderness to investigate a death at an isolated oil rig. The killing has all the marks of a ritual murder, and Ray must confront the traditions of his People to catch a killer — before he too becomes a victim. Important Note: This book was listed at the above mentioned price on the date and time of this post. Prices can and do change without prior notice. Please confirm the price of the book before completing your purchase.